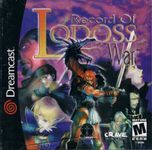 Based on the Japanese anime series, this Dreamcast original action RPG featured Nethack/Diablo-inspired gameplay & a isometric perspective. As a hero waking with amnesia, you have one role to fulfill: preventing the rise of Goddess Cardice. To do so will involve hours of hacking & slashing, upgrading weapons with an innovative rune system, and lots of dungeon crawling.